We use these buzzwords everyday but how accurate are they really? How accurate are those BI buzzwords? For example, a data lake sounds like something serene but it’s typically so full of headaches it’s more like a data swamp of hell. Another example is data wrangling which is used to describe data preparation. It sounds a little bit cowboyish, but the reality is most data preparation takes a lot of blood, sweat and tears to achieve a successful outcome. To buzzword or not to buzzword? Marketing people (including those at Yellowfin) love buzzwords. They’re used to create excitement in the industry. So at Yellowfin, we debated internally whether we should jump on the AI and ML bandwagon to describe the new innovations we’ve brought to market in Yellowfin 8. We decided not to because we didn’t want to focus on what algorithms we’ve used to automate the process of data discovery. We wanted to focus on how this helped our customers. Our customers are concerned about outcomes and what it means to their business. They generally don’t care what buzzwords we throw around on social media. I believe focusing on a real buyer’s outcomes is a much more powerful way to explain and sell our product than just yelling buzzwords at them. Every industry is chock full of buzzwords but my take is people are becoming much more wary of them. People know they’re being marketed to now so buzzwords don’t have the same impact they may have in the past. 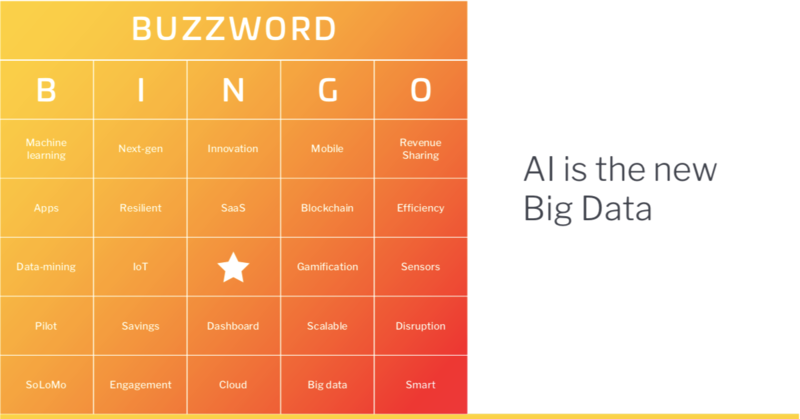 These are all reasons why we’ve created BI Buzzword Bingo (hit the 'download' button below). So the next time you’re at a conference or in a meeting, why not have some fun by playing Yellowfin’s buzzword bingo. You may even win a prize! Join the fun and download the buzzword bingo card to play at your next meeting or conference. How fast can you get a full house?